TENA Cliniguard Dry Wipes 10" x 13-1/4"
Tranquility Select Booster Pad 12" x 4-1/4"
Very soft and very strong wipes designed to quickly and gently cleanse the skin. 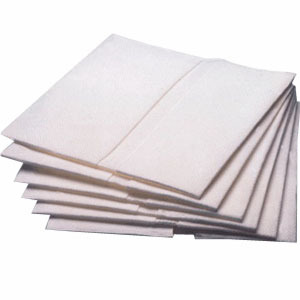 These multi-purpose dry disposable washcloths are ideal for perineal care, but are also suitable for the whole body, and are more hygienic than textile cloth alternatives. They can be used dry with TENA Skin-caring Wash Cream for perineal care, or used with TENA Bodywash and Shampoo for all-over cleansing. Alternative to textile washcloths for hygiene or personal care. Great for utility carts, clean up tasks. ReliaMed Soft Pack Wipes 12" x 8"